Recently I had a great privilege of getting an introduction to Will Adler, the founder of a company called Will Leather Goods. Many of you are familiar with Will Leather Goods but if you’re not it’s one of the country’s premier leather goods companies, making everything from leather bags to purses to wallets to belts and bracelets and keychains and even leather notebooks, soccer balls, footballs, and dog collars. If it can be made from leather, chances are Will Leather Goods makes it–and does it with quality craftsmanship, top notch materials, and excellent manufacturing, so much so that they guarantee their products for the life of the product (i.e. outside of normal wear and tear, if your product breaks because of poor workmanship they’ll stand behind it). We’ve talked in past posts about how “you get what you pay for” these days when you buy cheap mass produced schlock. Will Leather Goods is one of those companies that are holding up the standard that American companies were all once known for before so many of them sold out to the siren song of cheap mass production. I had a chance to experience this phenomenon personally–in the last 3 years I must have purchased about 6-8 cheap leather belts from one of those big box retailers. In every case, the stitching came loose, the leather broke, and in some cases the hardware even became undone (in one case a supposedly metallic belt buckle snapped in two, revealing that it wasn’t even metal at all but metal-painted plastic, and this was from a top name-brand manufacturer!). So I thought I was saving money but I ended up paying double or triple what it would have cost me if I’d just bought one of Will’s belts. You can check out Will Leather Goods products on their site, or you can check out their products at major retailers like Zappos, Nordstrom, or Amazon. But today I wanted to talk about how this company has given back in a huge way. We spend a lot of time talking about companies that help charities in remote areas of the world from Africa to Asia. Not a bad thing, of course, but sometimes it’s sad to see when individuals and the media focus so much attention on the needs of people thousands of miles away and are completely blind to the needs of people right around the corner. As a USA-based family business, based in Eugene, Oregon, Will Leather Goods recognized this and decided to focus on a critical need in the United States–public education. Once recognized as by far the top in the world, we’re now ranked #14 among developed nations for education–having dropped completely out of the top 10 and continuing on a downward trajectory. As the father of a 4-month old daughter this terrifies me. I was blessed to have gone through our school system when it was at its pinnacle of being the gold standard and it’s helped me become successful and productive. But I hear horror stories now of how America is losing its edge. Oh, you’ll get politicians pointing fingers at each other. Politicians on both sides of the political spectrum complain that the other side doesn’t do anything, and yet when we vote them into office they don’t do anything either–although you notice that they all magically leave Washington millions of dollars richer than when they came, while our schools keep deteriorating. Most of the citizens of the country just throw up our hands in frustration and complain, which quite frankly doesn’t do any good either. And then there are those who actually step up and DO something about it. Will Leather Goods is one of those companies. 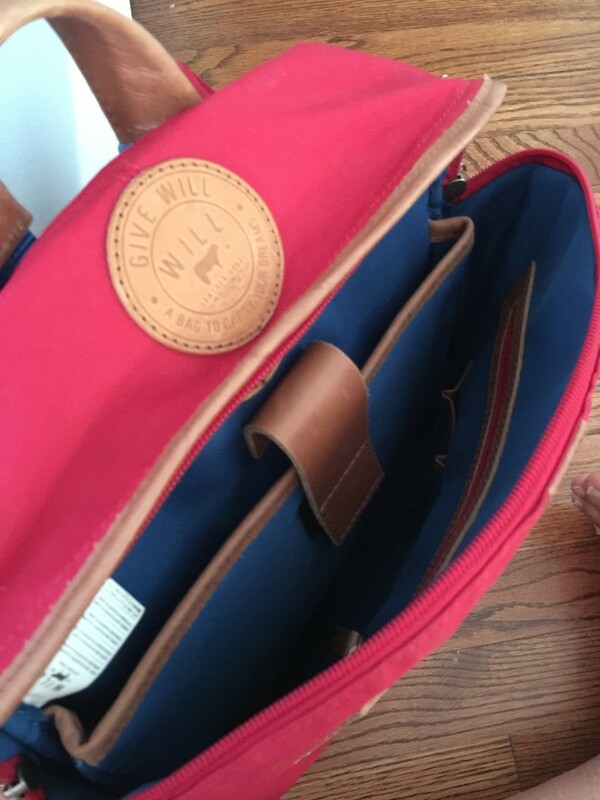 Specifically, Will Leather Goods has set up an initiative where they will go to underfunded public elementary schools across America and donate a backpack to children who need one, up to half a million of them across the country. And it’s not just any backpack. 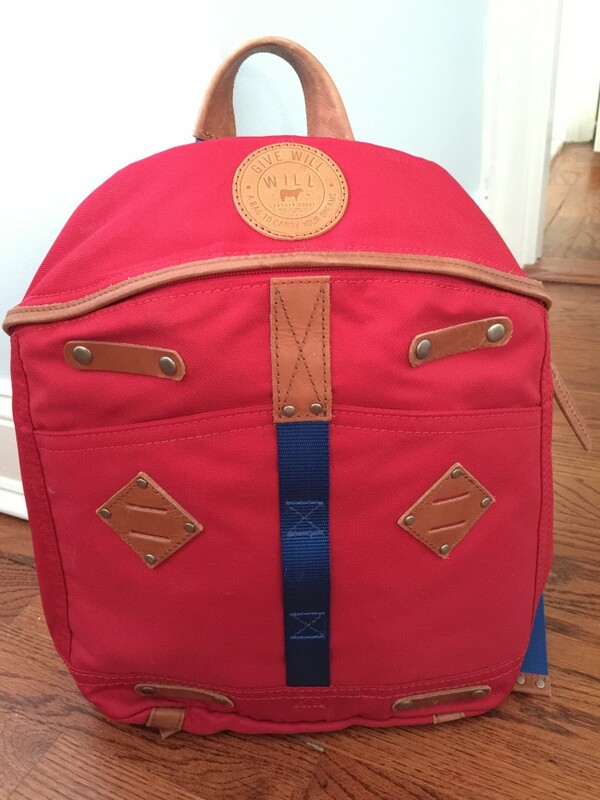 This is a backpack designed by Will Adler himself. It’s gorgeous to look at, made of wax coated canvas in beautiful colors and accents–black and yellow, blue and green, grey and pink, tan and red, orange and purple, purple and red, red and blue, and yellow and blue. It has real leather accents throughout, from the sturdy leather handle to the zipper pulls to the reinforced piece on the back that keeps the straps securely fastened to the bag no matter how much use it gets, to the piece of leather at the ends of the straps to keep them from fraying to two round Give Will badges that read “A Bag to Carry Your Dreams”. This is easily one of the best designed backpacks I’ve seen. I got a chance to sample one of these bags and I can vouch for how beautiful and sturdy it is. Compared to even other moderate-to-high end knapsacks and backpacks, the engineering on this is excellent. The straps are sturdy and thick, and anywhere on the bag that might be subjected to heavy use is reinforced, making it perfect for even the most active Kindergartener to 5th grader. There are two pockets in front, a zippered pocket in the inner front, and a place to put pencils, pens and other supplies. There are two main compartments, separated by a padded divider, the inner one of which can be secured with a velcro flap. On the outside are two additional zippered pockets. It is, bar none, one of the finest book bags you can buy for elementary school kids. One of the nicest things about this bag was just taking it out of the box. Right away you can smell the wonderful aroma of the real leather. This is NOT a bag that’s going to fall apart after a few uses. The color is bright and kid-friendly, not in a gaudy way like the latest Disney or Spiderman backpack but in a way that’s still fun and reflects the personality of the most important character in your life–your child’s! In fact, one of the best features of this backpack is that on the back it says “A bag to carry your dreams. My dream is…” and you can work with your child to fill it out, whether he or she wants to be an astronaut, an athlete, a policeman or fireman, a teacher, or president! I love this feature because it encourages the child to grab and hold on to perhaps the most important thing that we adults are squandering–their hopes and dreams. This generation is the first one in the country’s history where a majority of adults cannot say that they are confident that their kids will be more successful than they were. It’s an indictment on all of us, and another reason I admire Will Leather Goods so much for what they’re doing. Naysayers might scoff and ask, how is handing out a backpack going to solve the nation’s educational problem. But what I think this company has just taken the one thing that it excels at and applied it to helping kids. And one cannot underestimate what even a seemingly small thing can do for a child. If a child who has dealt all his life with bringing an old, torn up bag to school, what a difference giving this bag to him or her would be. Imagine the boost to their low self-esteem and confidence just a simple gesture of giving them this bag and telling them that yes, they are allowed to dream and that despite everything, the American dream is still alive and well for those who still dare to dream it, work hard, and grasp every opportunity. If only everyone in this country who has lived the American Dream could do the same and use their God-given talents to pay it forward instead of focusing solely on money, money, money, imagine what a difference it would make to our children, who are our nation’s most valuable “natural resource” that we are squandering. Hopefully seeing what Will Leather Goods will inspire this country’s entrepreneurs, small businesses and corporations to do the same. How can you help? If you buy one of these bags, or any other Will Leather Goods in one of their stores or online, Will Leather Goods will use part of your purchase to subsidize a bag for a child in need. And this includes when you buy a bag for your own child. I got a chance to interview Will Adler. His story is a fascinating one–he was originally a professional actor who was on many hit shows in the 1970’s (as a kid, I used to watch a show called CHiPS and I actually remember the episode that he was in :)). Then during the big Screen Actor’s Guide strike in 1981 he had to find other work. I’ll let him tell the story below, but suffice it to say that going from where he was to owner of one of the premier leather companies in the world is the stuff dreams are made of, and I admire and appreciate him passing it forward. I absolutely love the idea of providing donations to kids in underfunded public schools. How did you come up with the idea? I grew up in Motor City, Detroit and understand firsthand the experience between diversity and education. At a young age, I learned the importance of inspiration, creativity and perseverance to fulfill my own personal dreams. Now as a business owner, we wanted to create the shared value portion of our company based on these principals- education and inspiration. From there Give Will was able to take shape. 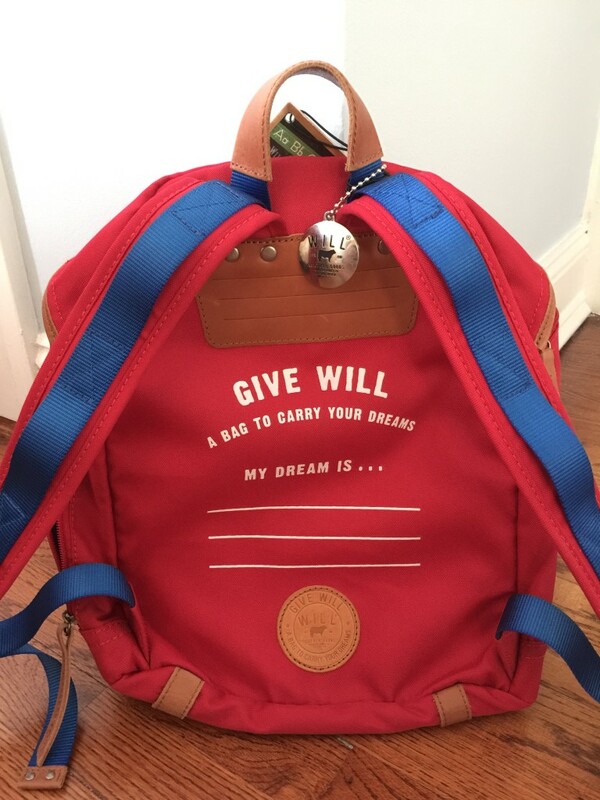 I noticed the back of the bag includes an area where the child can write his or her dreams. What are some of the things you’ve seen kids write in this space? What are other things you think we can do as a society to help kids achieve these dreams? The dreams for the future that we’ve seen are hopes to become a doctor, scientist, NBA/NFL professional, singer, dancer, policeman, fireman, music producer, video game designer, member of the army, college graduate, fashion designer, and teacher, just to name a few. The excitement and passion we witness from each student explaining their reasoning for their dream is incredibly moving! As a society, I think we can continue to be open and accepting of any dream that a child has for the future. By simply asking them to express their dream, we open a doorway to provide support and resources to help them fulfill it! Where are some of the schools you’ve helped to date? What has the response been like from the kids and the faculty and administrators? We’ve been fortunate enough to giveaway backpacks in Los Angeles, Portland, and Eugene thus far. We are gearing up to make two donations in my hometown of Detroit in a few months. The response from the kids and faculty is overwhelmingly positive! Everyone is always so excited that we provide such an incredibly well-crafted backpack for their students to use; and they admire that we ask children to be inspired to dream big! How did you make the transition from actor to expert leather goods designer? After graduating from the Goodman Schools of Drama in Chicago, I moved to Los Angeles to pursue my career in acting. During this time I was fortunate enough to land a variety of roles in CHiPs, Trapper John, M.D and Welcome Back Kotter. However, in 1981 there was a lengthy Screen Actors Guild Strike which stalled my career as an actor. At the time, I had a wife and a newborn baby and needed an income. It was my brother, a well-known Detroit retailer, who suggested I enter the garment industry until the strike passed to make ends meet. I took his advice and began selling handcrafted “Rainbow Belts” on the Venice Beach Boardwalk. I quickly discovered I had a passion and talent for leathercraftsmanship, business, and design. With the success of my business, I never ended up returning to acting and have been in the industry for over 35 years! I see from your IMDB page that you guest starred on an episode of CHiPs, one of my favorite shows growing up. What was that like? My thanks to Will Adler for his time and especially for setting an example for all of us of how to give back in such a meaningful way. I plan on looking to Will Leather Goods first whenever I need anything made from high quality leather, and I hope you do too.